RECOGNIZING THE NEED TO PRESERVE AND PROMOTE THE DIVERSE CULTURE AND HISTORY OF OUR AREA, THE COLFAX COUNTY SOCIETY OF ART HISTORY & ARCHAEOLOGY WAS ESTABLISHED IN 1939. The concept of a museum for Raton can be traced back with the first displays being exhibited at City Hall in the early 1930’s. Displays were relocated to Raton High School, this being the first of many moves due to inadequate space. The museum was moved to temporary quarters in the Carnegie Library in Ripley Park. The next move was to a two story home owned by Mr. & Mrs. Fred Lambert; located at the end of North First St. Following the sale of the Lambert property the museum relocated to a small stone building on Savage Ave. In 1963 the museum opened its doors at yet another location, the S huler home on Rio Grande Ave. The Shuler home was gifted to the City of Raton by Evelyn Shuler and Charles DiLisio and upon sale of the property the Society’s collection was stored in the Arthur Johnson Library. In 1975 the Society organized and facilitated a gift of the Coors Building on South First Street to the city as a museum from RO Anderson, CEO of Tinni Mercantile. By 2003, the Society had again out grown its space and started looking for a new location within Raton’s historic district. The First National Bank of Trinidad and First National Loan Production Office held an 11,000 square foot building in downtown Raton, after viewing the building and serious consideration the Society with contributions from Emily B Hughes and Kenneth Laird made an offer to purchase the property from the Bank, allowing the opportunity to continue our journey. December 2004 the Society closed on the real estate transaction and with many volunteer hours and financial contributions from individuals, businesses, and local foundations the renovation of the 1906 building was started. 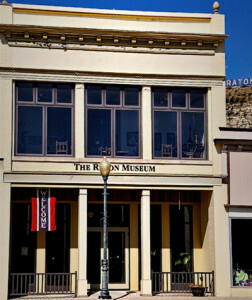 June 2008 the Raton Museum opened the doors at 108 South Second St, preserving the historical character of downtown Raton. The public is invited to stop in and discover our rich heritage through art, history & culture.